The Chinese smartphone maker Vivo is all set for the launch of its upcoming 'V Series' selfie-focused smartphone in Indonesia which was teased last week named Vivo V9. Now more images have been leaked online and show that the device has a notch design like iPhone X. The render images confirm that the upcoming Vivo V9 has a dual rear camera and comes with a 24MP Selfie camera. Based on the banner image in Indonesia's Vivo showroom confirms that the Vivo V9 smartphone is designed like the iPhone X notch. Recently many manufacturers introduced this notch design on their newer models like the Asus has introduced with its Zenfone 5 smartphone and the Oppo has also come with a similar design with its new Oppo R15 models. Vivo V9 is expected to come with a Snapdragon 660 SoC, and we expect that the complete specifications of the Vivo V9 smartphone will be unveiled soon. 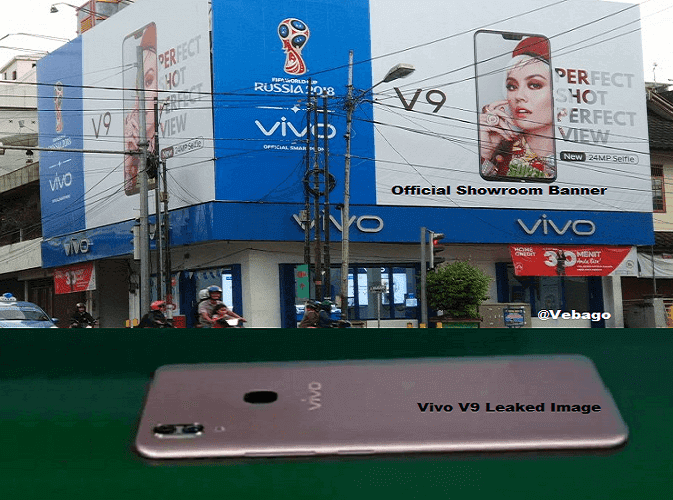 The Vivo V9 smartphone that has a notch design like iPhone X is expected to be announced soon in Indonesia and will be introduced soon in other countries including India.